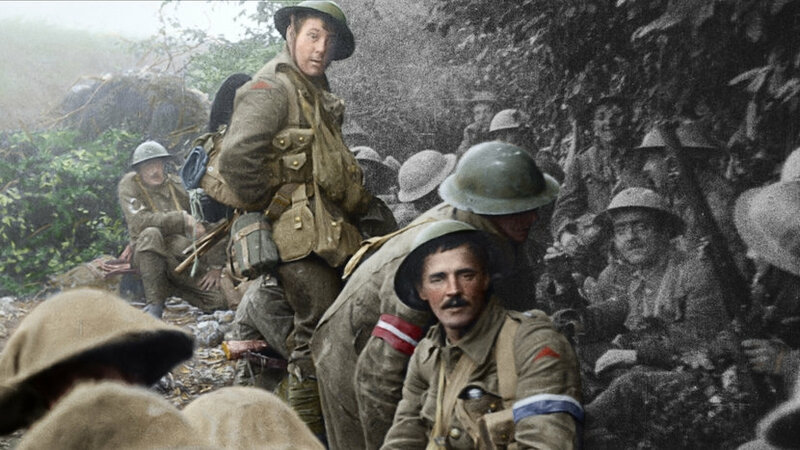 Four years ago, Peter Jackson was approached by the 14-18-Now organisation to make a thirty minute documentary on the First World War to mark its hundredth anniversary. 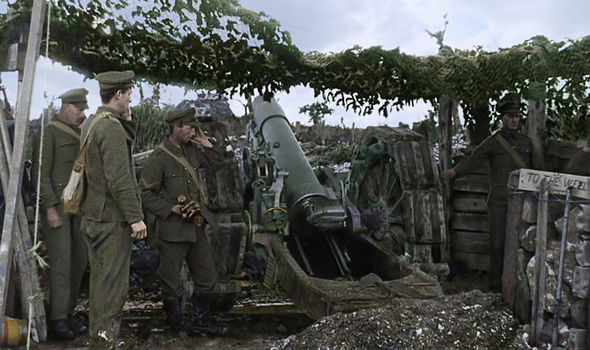 The only proviso was that he use archival footage held at London’s Imperial War Museum. Jackson readily agreed but realised that the surviving footage would need to be restored in order to present the best possible version of the movie he was going to make. In the end this meant a long, painstaking process that involved cleaning up the material, correcting a variety of frame rates to today’s standard of twenty-four frames a second, and then both colourising it and converting it into 3D. 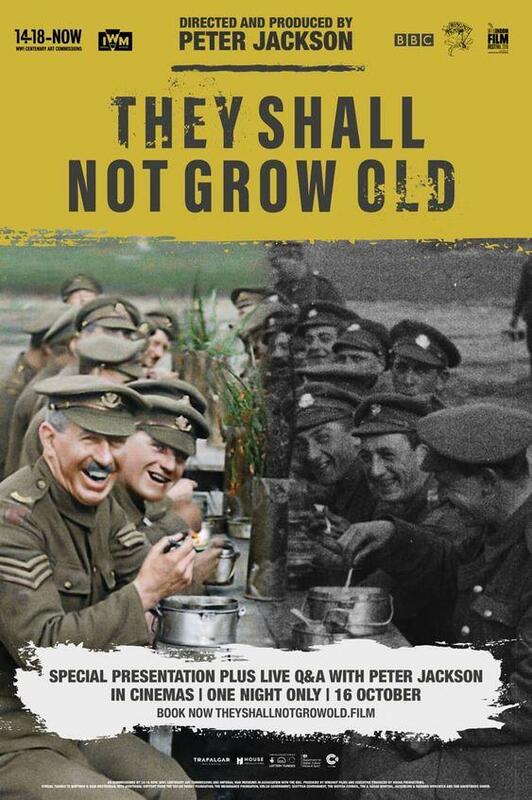 With recordings of World War I veterans conducted by the BBC during the Sixties making up the soundtrack, They Shall Not Grow Old (a transposition of the quote by Laurence Binyan), is a stunningly immersive and emotive experience that brings the so-called “Great War” to life in a way that has never been seen before. The application of modern technology gives the documentary an immediacy that’s both powerful and, in places, quite profound. And thankfully, what was meant to be a thirty minute piece, has been expanded to nearly a hundred minutes; and Jackson doesn’t waste a single one of them. The movie doesn’t begin with this new, remastered footage. Instead, we see old, damaged images of servicemen walking past a static camera, and it’s a little jerky, and either a little faded or too bright, but it’s what we’re used to seeing. But as the movie progresses, the images begin to improve. Black and white gives way to colour, the 3D becomes sharper and more pronounced (though without becoming distracting), and the footage itself takes on more and more detail. What emerges is a compelling visual exploration of a serviceman’s life on the battlefield, when fighting and at rest, and from the time war was declared and men – and especially teenagers – rushed to take up arms, to the Armistice and the problems they faced when they returned home. Jackson tells the story of the war from the perspective of the British (naturally), but also makes room for the Germans, and the similarities between the men who fought on both sides. There’s footage of British and German medics working side by side to save the injured and the dying, and examples of the lack of ill will shown to German captives. Jackson makes the point very succinctly: neither side knew why they were fighting, and were sympathetic towards, and respectful of, each other. But while the visuals are the movie’s “main attraction” as it were (and rightly so), where Jackson truly excels is in the decision to use those recordings from the BBC. So much detail is present in these remembrances that almost every single one of them sheds light on the emotions and feelings and opinions of those who fought. These voices from the past vividly illustrate the hopes and fears that were felt at the time, and they remind us that initially, many thought the war would be an adventure. There’s humour too, a reminder that these men couldn’t allow themselves to be overwhelmed by the nature of their situation in the trenches. And then, as if these recollections aren’t enough, Jackson goes one step further: he gives voices to the men in the archival footage through the use of lip reading experts who examined the footage and worked out what was being said. Now this footage comes complete with an audio track that would never have been heard otherwise. It’s disorientating at first, but the effect is incredible: combined with the colour and the increased detail of the image, it’s as if we’re seeing contemporary footage, and not imagery that’s a hundred years old. Jackson has done something extraordinary: he’s made the past look and sound as real as the present. Rating: 9/10 – for some, this may prove to be Peter Jackson’s finest work (yes, even better than The Lord of the Rings trilogy), and on many levels it is; a triumph of technology plus a philosophical approach to the material that focuses on the men who fought rather than the reasons for their fighting, this is hugely impressive, and a powerful reminder of the human ability to endure and/or overcome the worst of adversities.